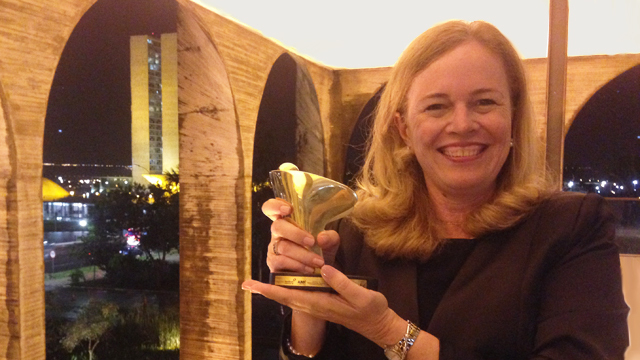 Dr. Karin Nielsen, director of the Center for Brazilian Studies, toured schools, met several Brazilian ministers, attended a Diaspora Network policy workshop and participated in an awards ceremony at the Itamaraty Palace in Brasilia — all as part of a week-long (May 25–29) celebration of the Brazil Diaspora Awards. Dr. Nielsen took top honors for health sciences. May 21, 2015, Porto Alegre, Brazil. Prior to the Diaspora Award events, Dr. Nielsen met with Sandra Fagundes (center), superintendent of the Grupo Hospitalar Conceição (GHC) in Porto Alegre, to discuss the current studies at Conceiçao and the end of clinical trial HPTN 052 at that institution (the trial began in 2002). Also in attendance were GHC's technical director, Jose Fossari (right), and the chief of the Infectious Diseases Group, Dr. Breno Riegel Santos (left). 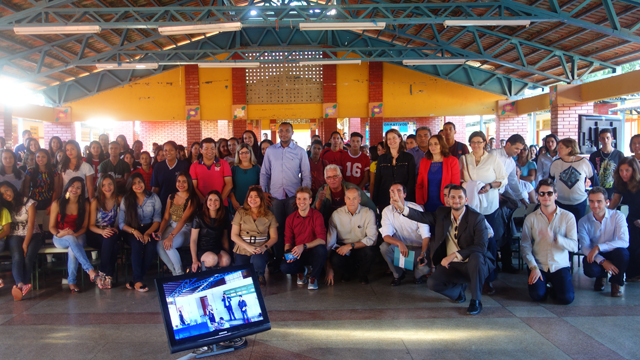 The delegation of Prêmio Diáspora Brasil winners and honorable mentionees in front of a secondary public school. The annual award is conferred on three Brazilians who inspire future generations and have fostered a positive image of Brazil abroad (in the health sciences, computer sciences/ technology and business). 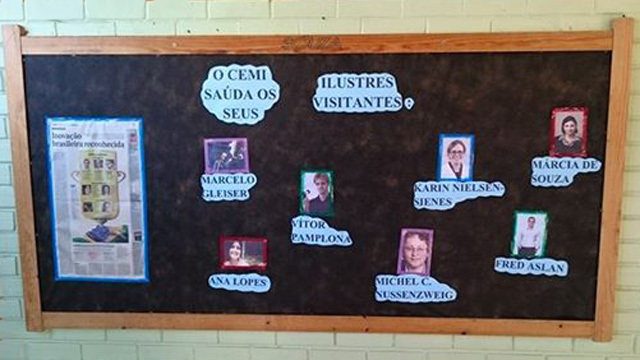 Bulletin board at one of the secondary schools visited by the Brazil Diaspora Award delegation in Brasilia (Federal District). 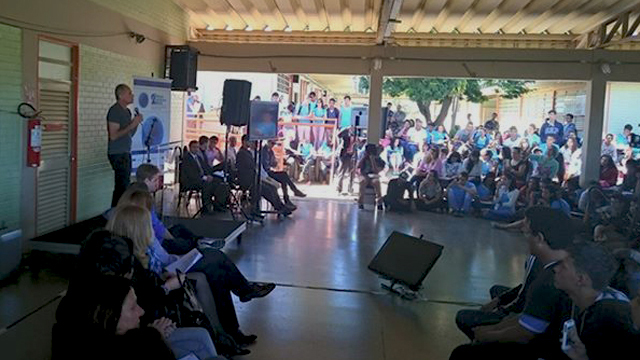 The delegation visited four schools in Brasilia and the adjacent state of Goiás: Colégio Estadual Ocidental, Colégio Estadual Herbert de Souza, Centro de Ensino Médio Integral do Gama and Centro Educacional do Cruzeiro. 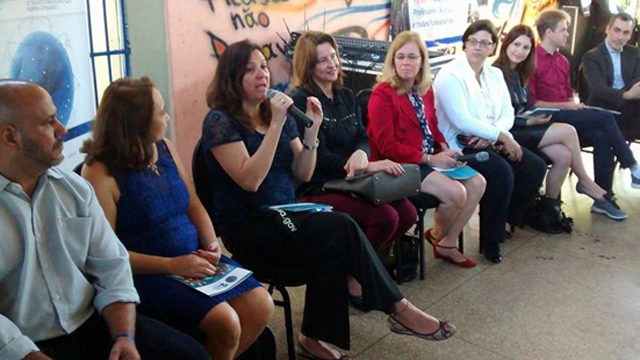 Students, teachers and administrators at Colégio Estadual Herbert de Souza, Goiás. 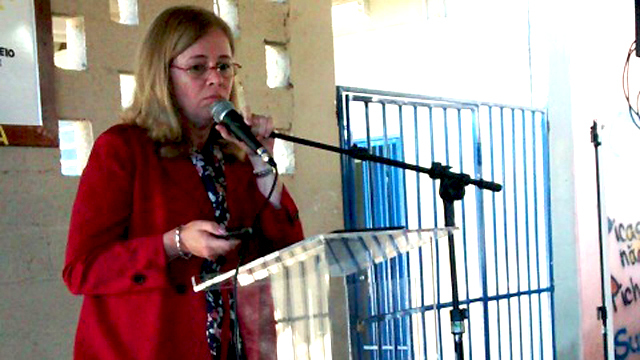 Dr. Karin Nielsen speaks about her work as a pediatric infectious disease specialist in the U.S. and in Brazil at the Colégio Estadual Ocidental. Marcelo Gleiser, professor of physics and astronomy at Dartmouth College and an honorable mentionnee for the 2015 Prêmio Diáspora Brasil, speaks to students at a Brazilian secondary school. 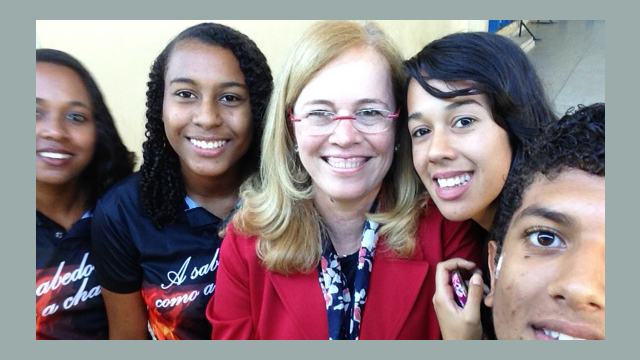 Dr. Karin Nielsen with students at the Colégio Estadual Herbert de Souza. Founded by the famous Brazilian anthropologist who launched a campaign against hunger in Brazil, the school is located in a very poor area in the state of Goiás. Delegation at one of the school discussions. 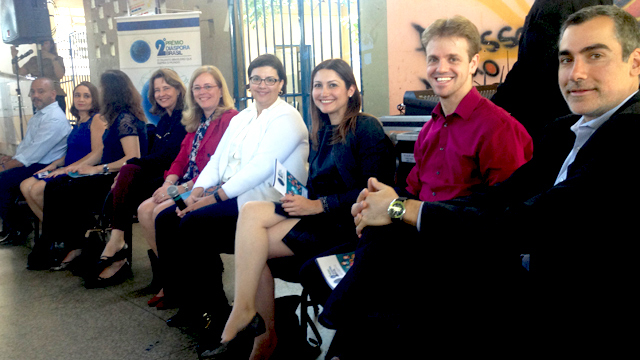 From right: Dr. Fred Aslan of Advance Medical, winner in the business category; Vitor Fernando Pamploan, of MIT and cofounder of Eyenetra Inc., winner in computer science/ technology; Ana Laura Lopes of MIT and Lincoln Labs, “highlight” awardee of the Diaspora Network; Marcia de Souza Lima of the Sabin Vaccine Institute in Washington, DC, awardee “highlight” of the Diaspora Network; Dr. Karin Nielsen; and other members of the delegation. 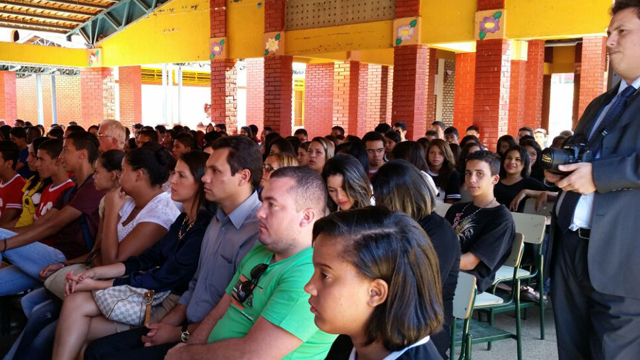 Secondary school students listen to a presentation by a member of the Prêmio Diáspora Brasil delegation. Scientist Duilia de Mello, last year's winner of the Diaspora Award, NASA astrophysicist and professor of physics and astronomy at the Catholic University of Washington, DC, speaking at a secondary school, surrounded by other members of the delegation. 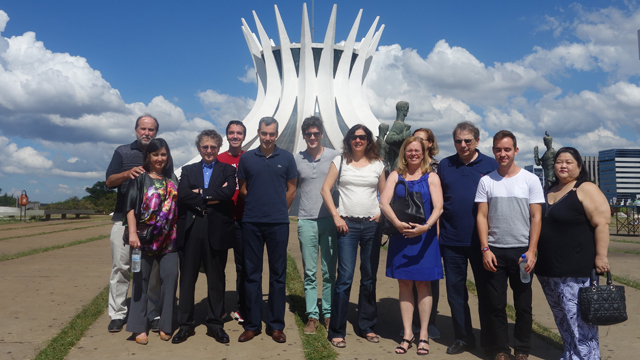 Prêmio Diáspora Brasil delegation in front of the Cathedral of Brasilia, designed by celebrated Brazilian architect Oscar Niemeyer. 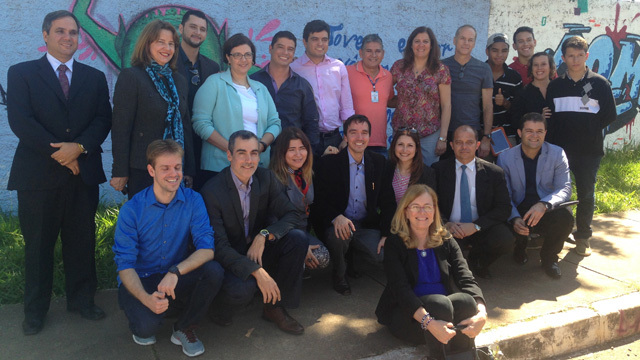 The delegation toured a number of famous sites in the Brazilian capital. 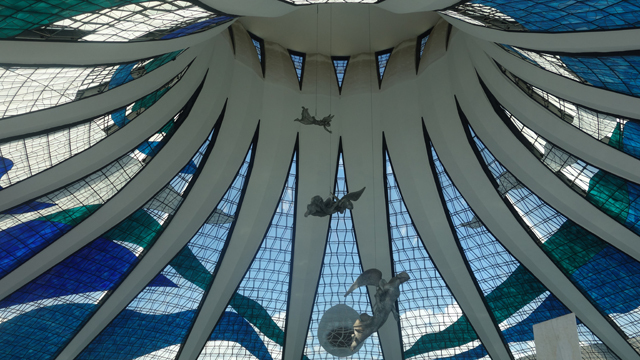 A view from inside the Cathedral of Brasilia. The President Juscelino Kubitschek (JK) Memorial. Juscelino was the extremely popular Brazilian president responsible for the construction of Brasilia in the exact center of Brazil; the capital was founded in May 1960. 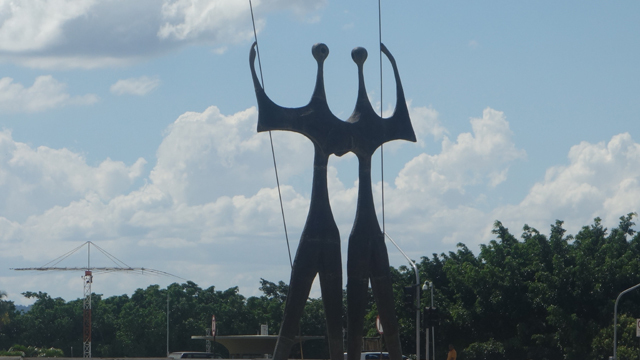 The Dois Candangos Monument or Os Guerreiros (Warriors or Two Brothers Monument), in honor of the builders of Brasilia. 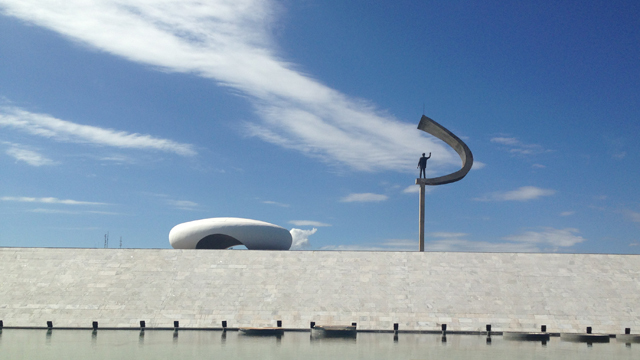 The landmark sculpture by Bruno Giorgi is located in front of the Palacio do Planalto (the Brazilian White House) and the National Congress. It was erected to pay homage to the thousands of workers who built Brasilia and has become the symbol of the city. This monument has special meaning for Dr. Nielsen as two of her uncles participated in the construction of Brasilia. 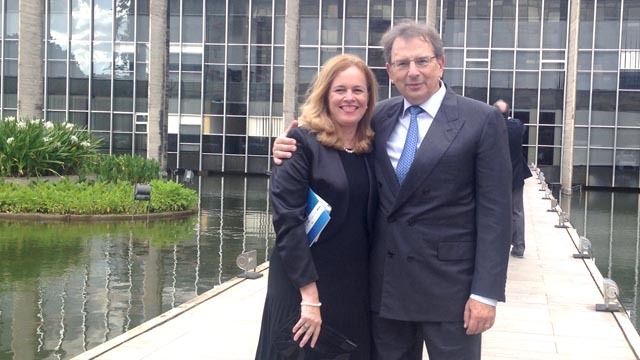 Dr. Karin Nielsen and her husband, Dr. Marius Saines at the Itamaraty Palace. Itamaraty Palace, headquarters of the Ministry of Foreign Affairs of Brazil. 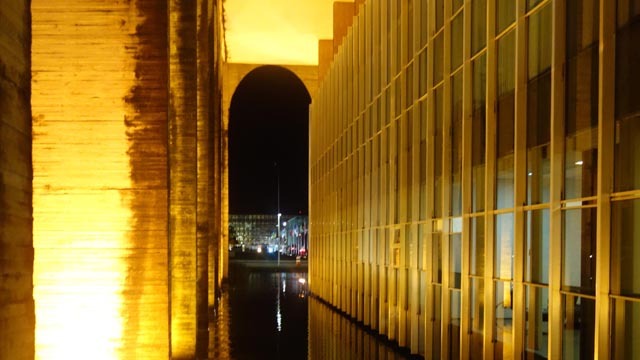 Designed by Oscar Niemeyer, the palace hosted the award ceremony for winners of the 2014 Prêmio Diáspora Brasil on the evening of May 28, 2015. IItamaraty Palace, headquarters of the Ministry of Foreign Affairs of Brazil. 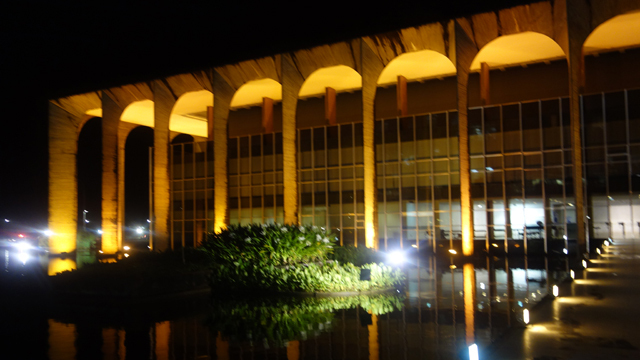 Designed by Oscar Niemeyer, the palace hosted the award ceremony for winners of the 2014 Prêmio Diáspora Brasil on the evening of May 28, 2015. Selection Committee for the 2014 Prêmio Diáspora Brasil awards. 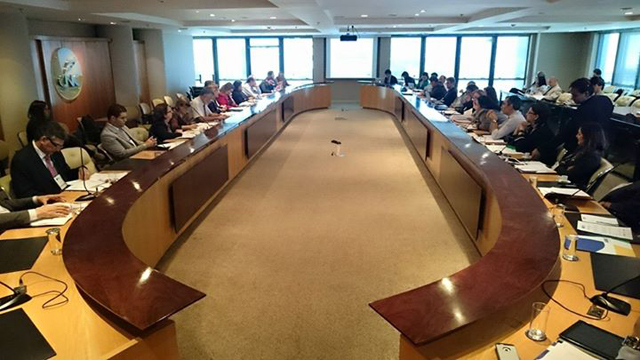 The committee was led by the Brazilian Minister of Foreign Affairs Ambassador Mauro Vieria, the Minister of Science, Technology and Innovation Aldo Rebelo, and the Minister of Development, Industry and External Commerce Armado Monteiro Neto. 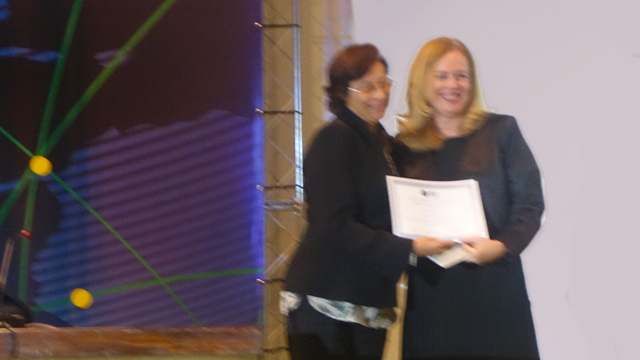 Dr. Nielsen receiving her award at the Itamaraty Palace. From left: Honorable mentionee Dr. Michel Nussenzweig, of Rockfeller University in New York, Dr. Karin Nielsen (winner, health sciences category), and honorable mentionee Professor Marcelo Gleiser of Dartmouth College. 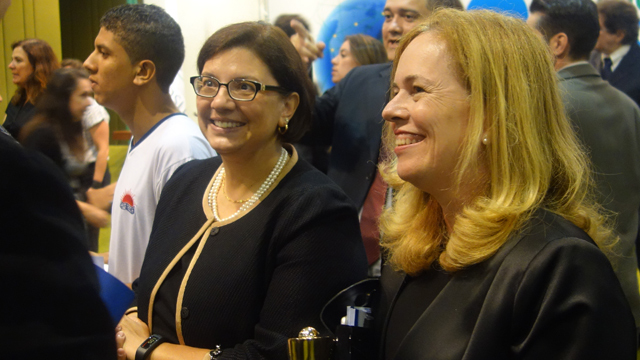 From left: Dr. Marcia de Souza Lima and Dr. Karin Nielsen at the award ceremony. 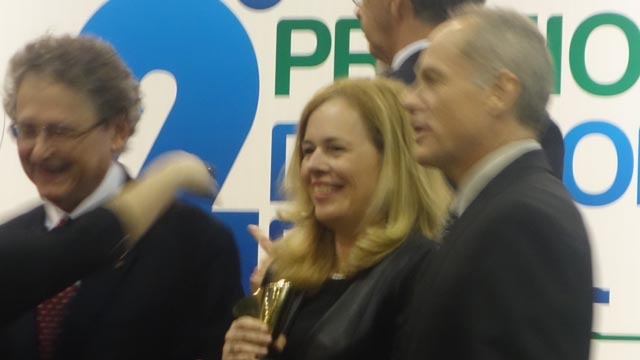 Dr. Karin Nielsen holding the 2014 Prêmio Diáspora Brasil at the Itamaraty Palace. 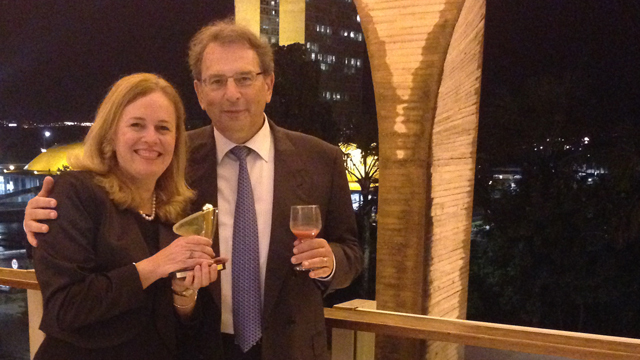 Dr. Karin Nielsen and her husband, Dr. Marius Saines at the reception at the Itamaraty Palace. 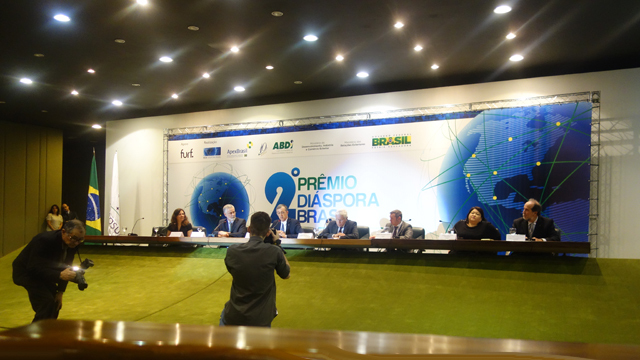 Diaspora Network workshop, ”Mobilizing the Brazilian Diaspora for Innovation,” hosted by the Brazilian Industrial Development Agency (ABDI) on March 29, 2015. 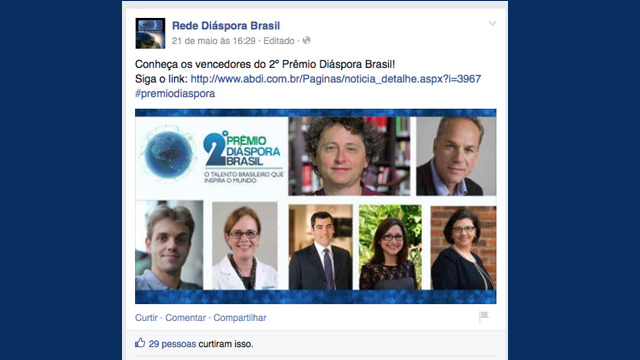 One of the many Facebook postings about the Prêmio Diáspora Brasil winners made during the week of events associated with the award. Click here for an earlier article that describes the award and Dr. Nielsen's research. Download the Portuguese-language booklet on the Prêmio Diáspora Brasil below..